That’s been our motto since we first started our business in 1993 and we take great pride in the service that we provide our customers. We are a locally owned and operated cleaning and restoration business with over 30 years of experience proudly serving Elyria, Ohio and its surrounding communities. The owner, Nolan Mayle, started his journey in the cleaning business in Amherst in 1982 working for a local carpet cleaning company. Nolan was professionally trained by the Bane-Clene Institute where he learned proper cleaning techniques for cleaning all types of carpet and upholstery. The Bane-Clene Corporation is one of the country’s most well respected equipment manufacturers as it heats water to 160 degrees F and vacuums for a deep, lasting clean of your carpets and rugs. We also use environmentally friendly bio-degradable products for cleaning that are safe for you and your family. 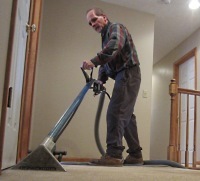 Let Nolan’s 30+ years of professional experience and training in carpet cleaning and janitorial services work for you. We provide you with a quality service that you will be pleased with. At Nolan’s Carpet Cleaning, we care about our customers and we take great pride in the work we perform. Our customer’s satisfaction is our highest priority!